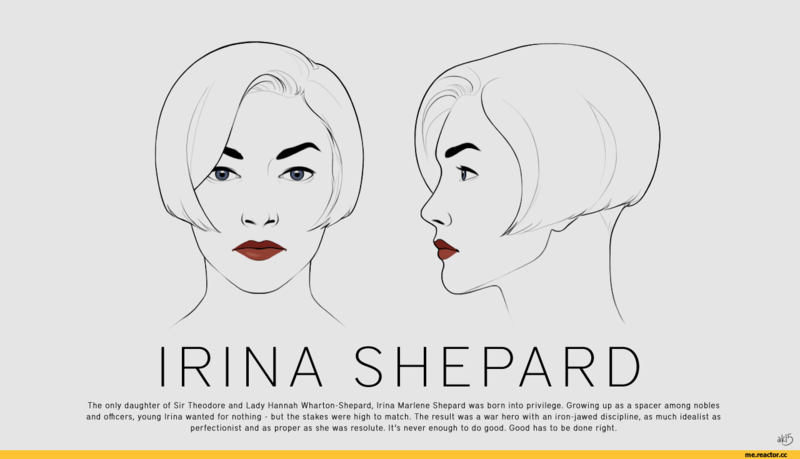 Femshep :: Zaeed :: Commander Shepard :: ME персонажи :: Mass Effect :: nihilnovisubsole :: фэндомы / картинки, гифки, прикольные комиксы, интересные статьи по теме. 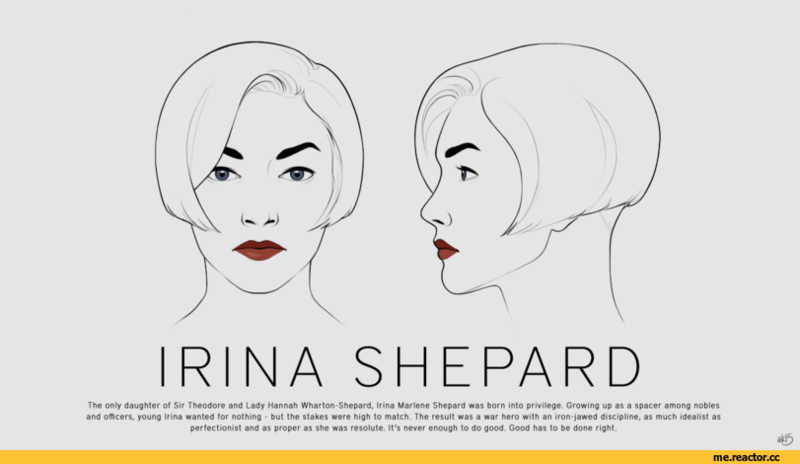 ﻿The only daughter of Sir Theodore and Lady Hannah Wharton-Shepard, Irina Marlene Shepard was born into privilege. 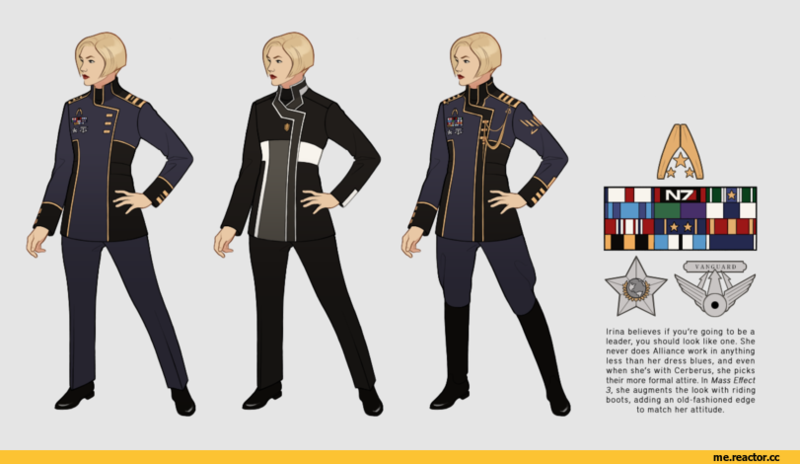 Growing up as a spacer among nobles and officers, young Irina wanted for nothing - but the stakes were high to match. The result was a war hero with an iron-jawed discipline, as much idealist as perfectionist and as proper as she was resolute. It's never enough to do good. Good has to be done right. 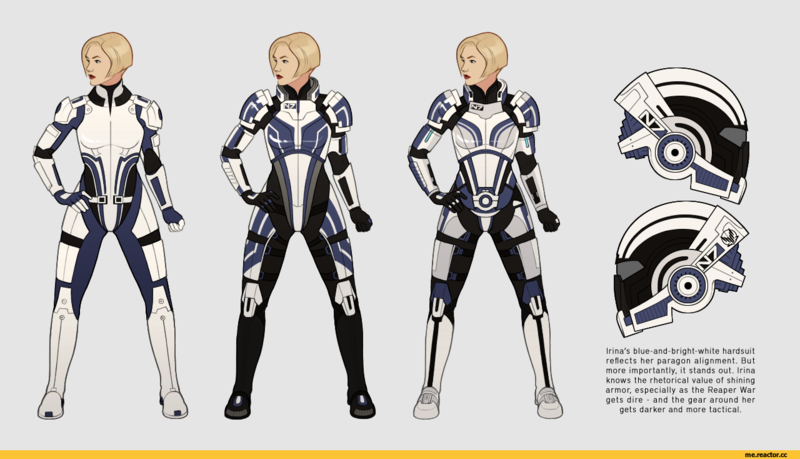 ﻿Irina's blue-and-bright-white hardsuit reflects her paragon alignment. But more importantly, it stands out. Irina knows the rhetorical value of shining armor, especially as the Reaper War gets dire - and the gear around her gets darker and more tactical. ﻿Irina believes if you're going to be a leader, you should look like one. She never does Alliance work in anything less than her dress blues, and even when she's with Cerberus, she picks their more formal attire. In Mass Effect 3, she augments the look with riding boots, adding an old-fashioned edge to match her attitude. ﻿Irina doesn't like to go out often in civilian clothes. But when she does, she likes to look simple, practical, and expensive. 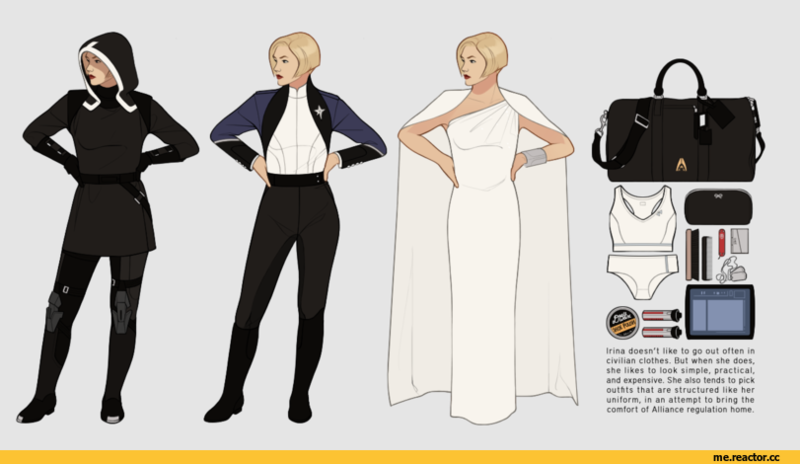 She also tends to pick outfits that are structured like her uniform, in an attempt to bring the comfort of Alliance regulation home. 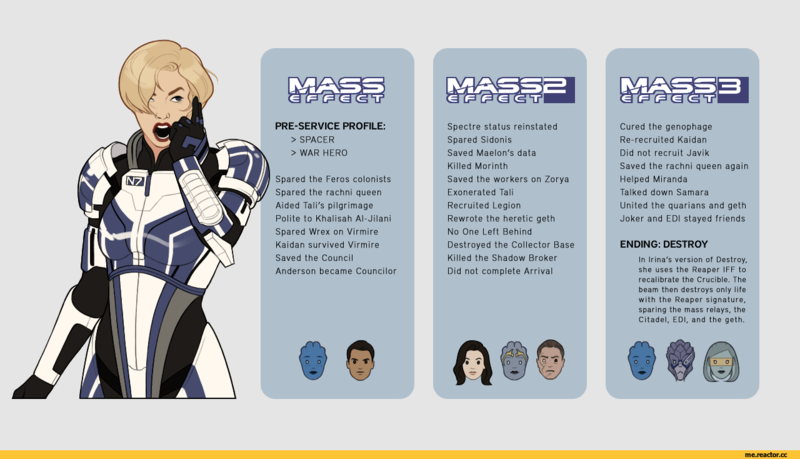 ﻿PRE-SERVICE PROFILE: > SPACER > WAR HERO Spared the Feros colonists Spared the rachni queen Aided Tali's pilgrimage Polite to Khalisah Al-Jilani Spared Wrex on Virmire Kaidan survived Virmire Saved the Council Anderson became Councilor Spectre status reinstated Spared Sidonis Saved Maelon's data Killed Morinth Saved the workers on Zorya Exonerated Tali Recruited Legion Rewrote the heretic geth No One Left Behind Destroyed the Collector Base Killed the Shadow Broker Did not complete Arrival Cured the genophage Re-recruited Kaidan Did not recruit Javik Saved the rachni queen again Helped Miranda Talked down Samara United the quarians and geth Joker and EDI stayed friends ENDING: DESTROY In Irina's version of Destroy, she uses the Reaper IFF to recalibrate the Crucible. The beam then destroys only life with the Reaper signature, sparing the mass relays, the Citadel, EDI, and the geth. ﻿Irina's journey through the Mass Effect series is one of both personal and moral development. At first, her unyielding standards put her at constant odds with her crew, and she believes in saving the day out of a sense of duty alone. 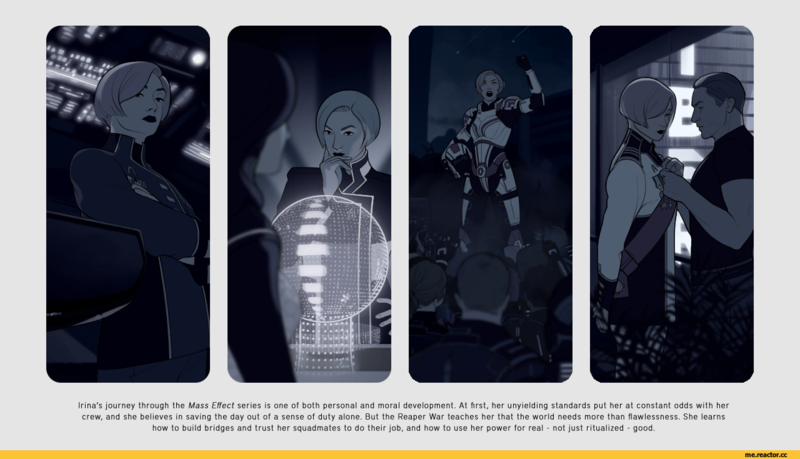 But the Reaper War teaches her that the world needs more than flawlessness. She learns how to build bridges and trust her squadmates to do their job, and how to use her power for real * not just ritualized - good. хмм.. а продолговатый красный предмет справа от расчески, это...?